Online trainings for companies: What do you have to pay attention to? The market for online trainings and e-learning is growing steadily in Europe. Comparing studies published in recent years by MMB Institute for Media and Competence Research (from 2017 or from 2014) it becomes clear that Germany’s e-learning market is subject to steady growth. A projection in MMB’s E-learning Business Ranking 2014 shows an increased turnover from around 513 million to 582 million from 2012 to 2013. While this is an increase by nearly 14%, e-learning cannot expected to be successful in any business just like that. The following 5 tips will help you make your online training more effective – for companies and learners. 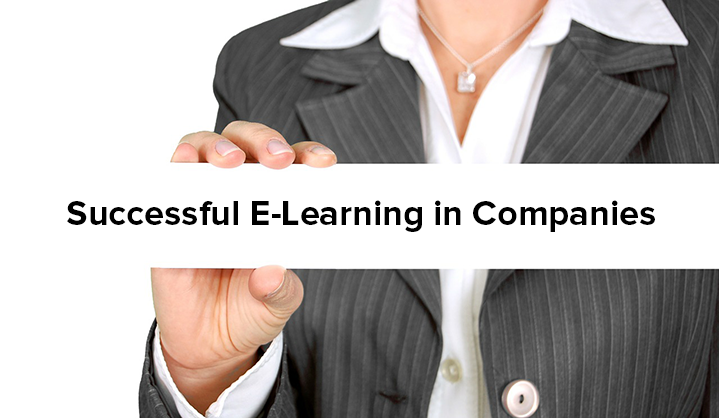 There is often resistance in companies when it comes to the introduction of online trainings. This is based on diffuse and mostly unjustified fears: employees sometimes fear that their job could become irrelevant due to the introduction of e-learning. In 1983, Noel Tichy described this as follows: Humans are creatures of habit who tend to repeat things they are already used to. We already tried that. This isn’t how we’re working here. It’s too complicated. That’s not our problem. Thus, leave enough room for the complex process of change, especially if employees in your company have not yet studied online. The first stage serves as preparation for change. People affected by this change will be informed and involved in the change process at an early stage. This way, resistance can be reduced and opinions and possible fears can be expressed directly. Explain the benefits of introducing e-learning in your company, as well as the disadvantages of no change. Transparency is also important: ignorance is a poison for the change process. This first step opens up people and structures. Thus, change will be easier and success more likely. A thorough preparation also eliminates unnecessary expenses. The second stage comprises the actual implementation of change. Keep in mind that for most people, change is not easy and requires energy. The process of change should be supported by either the person responsible or you. Make sure that problems are solved and uncertainties are eliminated. Respond quickly to difficulties to avoid rumors and unnecessary escalations. In the final stage, the change should be more firmly established and not any longer seen as “alien”. Make sure that new processes meet the afore-set criteria and that the plan is maintained. Motivate your e-learners permanently. Decision makers should still be convinced of the change and support it. It is an advantage for everyone involved to be able to give feedback and take it seriously. Last but not least: celebrate the successful change together! As a trainer, get to know your participants and create a personal atmosphere this way. It is also helpful if your participants know each other, as they will be working together in many cases. A personal meeting is the best idea, however, not always realizable (too much distance, too little time, etc.) and can be substituted with an online conference. If the learners do not have any experience with online training, they should not be overtaxed at the beginning and, above all, should stay motivated. To avoid unnecessary frustration, as a trainer, you should give your trainees an understanding of the features of online training from the very beginning. Independent learning plays an important role in e-learning. Learners have to organize themselves well and ideally be motivated intrinsically. What they have learned will be strengthened more sustainably this way. Learning requires time. A company has to grant its employees enough time for doing so. Cooperative scenarios especially require preservation of social manners.The best solution would be to provide a netiquette or let participants agree to a code of conduct. A short example can be found here: example for a code of conduct. Anchor these four conditions in your online training concept right from the beginning. Permanently generate the attention of learners, for example by a vivid design of learning content through usage of video, illustrations, text, and sound. By relevance, Keller and Kopp mean a learning offer that is aligned with characteristics and needs of learners, and thus fits their world. This way they can relate to learning content. Inform your learners about specific requirements of the course, as well as evaluation criteria. Provide useful tasks so that learners can strengthen their knowledge. These tasks should be based on learners’ qualifications and abilities and should not overtax them. This way you strengthen the participants’ confidence. Satisfaction can arise through intrinsic and extrinsic motivation. Give learners the feeling they are doing something meaningful that is important for themselves. Further increase motivation by means of extrinsic rewards such as positive reinforcement and motivational feedback. Last but not least, you should always maintain a consistent evaluation level. The principle “form follows function”, which derives from the design sector, states that the form should always follow the function as the function is more important. This statement can be transferred to e-learning: learning systems with a sheer infinite range of functions let you lose sight of what really matters. Is it effective to include as many functions as possible, simply because they are available and using state of the art technology? Definitely not. The target group and their requirements should always be considered. Does everything have to be interactive, clickable, and moving, or is a text with an explanatory illustration enough? It is important to focus on learning content and target group. If learners lose the overall view or get distracted by unnecessary trapping, they not only lose the desire to carry on, but also their motivation. In this case, less is more: the fewer complex elements there are to think about, the more time can be spent on the learning content. Thus, the learning platform should be as intuitive as possible and have a responsive design. This type of design allows a learning platform to be usable on all devices, making it ubiquitous. Clearly structures teaching and learning content ensures better learning success. As a trainer, you should also pay attention to the availability of a WYSIWYG editor, and the possibility to quickly add different (external) contents such as pictures, videos, and slideshows to your courses. It also comes in handy when you can upload PowerPoint slides and convert them into a course – it saves time and, thus, money.